If ever a musician fitted the classic-quip remark of "young, good looking, extremely talented, affable, looks even younger than he is… I hate him" it’s Laurence Jones. The reality of the blues rockin’ situation however is Jones, still in his early twenties, has three critically acclaimed albums under his guitar strap, each stronger than the last. A fourth, recorded with legendary blues producer Mike Vernon, is on the way. He also has two British Blues Awards (Young Artist of the Year 2014 & 2015) to his name as well as a number of accolades from his peers including Walter Trout’s declaration that "Laurence Jones is a cross between Buddy Guy and Eric Clapton; he is a genius." But if you believe that everything comes with a price, Laurence Jones has that covered too. Jones is one of what is now estimated to be at least 115,000 people in the UK suffering from the chronic digestive and intestinal condition known as Crohn’s Disease. Laurence Jones however, driven by his passion for his music and love of performance, doesn’t let his full blown version of Crohn’s get in the way of his dedication to the musical cause; which makes him not just an exceptionally talented musician but an inspiration to many. Laurence Jones: We did, yeah, and it was great! We played four shows and three of them were sold out. That was my first set of tour dates in Finland actually, although last summer we did play the Puistoblues festival there; that’s the biggest blues festival in Europe and we had about thirty-five thousand people watching us – we played before Robert Cray, which was absolutely amazing. So a lot of people that saw us at the festival came out to see us again, on this tour. RM: That’s what it’s all about for so many blues bands and artists – exposure through live performance, getting yourself noticed and building that reputation. LJ: Exactly. The old-school way of doing things! LJ: Yes! We’ve been looking forward to this since we came back home from Finland because we love playing on our home turf and every year our audience grows across the UK. We’re seeing a lot of younger blues fans as well; audiences of all ages are coming out to see our shows, which is really cool. RM: That’s a testament to both you and your band’s ability to deliver and further proof of the blues and blues rock resurgence we have right now in the UK. LJ: It’s a great time for the blues but it’s never, really, gone away; it's always been there. It’s in different genres, it’s in everything, it’s a feeling. That’s why I think more and more people are finding they can relate to it and why more and more younger people are getting in to it. RM: Which can only be good for the scene. As regards the fact you are now headlining that’s no more than your talents deserve; talents we first heard emerging on your debut album Thunder in the Sky. You were only nineteen when you recorded that album? LJ: Actually I was eighteen when I recorded Thunder in the Sky! RM: [laughs] That’s even more ridiculous – by that I mean while the album is a solid mix of blues rock and more traditional blues, the playing and phrasing on that album belies your age; there is some extraordinarily good playing on the title track, for example. LJ: Thank you man. They say the first album is always the easiest one because you’ve had all your musical life to write it; although I was only eighteen I’d been playing since I was fourteen and performing, every weekend, in pubs. RM: There are a number of great, young players around including Ben Poole and Chantel McGregor, who was a genuine child-guitar prodigy; but to exhibit that sort of phrasing and tone at eighteen? Pretty remarkable. LJ: Yes, and I think also, at that point in time, there wasn’t loads of young guys coming through. There was me, Oli Brown, Virgil and the Accelerators, perhaps a few others, so my influences were more from old school people like Jimi Hendrix, Eric Clapton and my musical hero Walter Trout. I’ve also been very fortunate to play with my heroes – people like Johnny Winter, Kenny Wayne Shepherd and of course Walter; they have taught me and mentored me along the way. LJ: Yes. B.B. King, Buddy Guy and even further back to Robert Johnson and Big Bill Broonzy. I always listened to, and took in, as much as possible; when I first saw a video of Jimi Hendrix I immediately wanted to find out and hear where he was getting it from. From there I moved forward and found guys like Stevie Ray Vaughan and Eric Clapton; it all links together, all the way down that line. RM: Absolutely; a blues coloured thread, if you will. You mentioned blues being a feeling earlier – there are many who play the blues, and play it very well, but then there are those like yourself that truly feel the blues. LJ: Well, for me, the blues is a feeling. You can be as technical as you want and you can play as many notes as you want, but if you can’t play just one single note, with feeling? There’s no point in playing the blues. RM: Indeed. B.B. King, on one note, was instantly recognisable and could saturate that note in feel. Sometimes the space between the notes is just as important; that’s something else B.B. King felt as well as any before or since. LJ: Exactly. B.B. King, from where he came from, you can feel that history, that suffering and pain, in his playing. I look up to those guys because they are not just musicians; they are true showmen who wear their hearts on their sleeve. That’s what I try and do with my songs; I like to write about things that really mean something to me. I can’t go on stage and sing something that doesn’t mean anything; that’s not going to connect with me and it’s definitely not going to connect with the audience. And that’s what it’s really about for me – connecting with the audience and creating that connection through the music. RM: We started to get a true sense of your feel for the blues on your second album Temptation. It’s a very bluesy album as opposed to a more traditional British blues rock release; I would surmise that was influenced by the fact you recorded it in Louisiana with renowned blues singer and guitarist Mike Zito at the production helm? LJ: It was about all of that, yeah. When I flew out to Louisiana I met Mike, who was playing with the Royal Southern Brotherhood at time; we also had Derek Trucks’ drummer Yonrico Scott and Charlie Wooten on bass. And then there’s this young British guy who has just flown over to be with these really experienced Louisiana and Chicago players [laughs]. So Temptation was a mix of my lifestyle, music and experiences mixed with theirs. RM: The results are an album that works wonderfully well – and how could you not learn from that kind of experience? The whole thing must have been such a thrill on a personal and musical level. LJ: I learned so much from that session; I actually went on to produce my next album with my bass player Roger Inniss because I had learned so much from working with Mike Zito. The record label, too, were very supportive. They gave me the opportunity and the chance to have that freedom – you don’t often get that nowadays, in the music industry. It’s great that we have such freedom in the blues because you don’t get that sort of freedom in modern pop music; a lot of it is so computerised. RM: Well, while there are some great, creative pop artists out there we have a manufactured pop industry delivering a phenomenally popular but completely insubstantial, no substance, fast-food product. Pat Travers once said to me that what we now have is a "music business and a show business." LJ: One of my first ever tours was with Pat Travers. Pat was so cool and proper old-school; he would just go out there and deliver every night. He was all about doing as many gigs as possible and selling albums on the road. I learned from that. Last year for example we did two hundred and fifty shows; but that’s where you learn your craft – on the stage. RM: Pat is, sadly, a great example of the thin-line that exists in the music industry. Highly acclaimed and an exceptional guitarist, Pat should be a touring and album selling artist on par with the biggest blues rock acts in the business. There are a myriad of reasons why that’s not the case but, as I say, thin line. LJ: It also depends just where you are – right place at the right time – and it’s not what you know but who you know. You can have as much talent as you want but you have to have that bit of luck, as well as a good team behind you. I’m really fortunate that I have good management, a good record label, a good band, a lot of positive press and great fans – it all seems to have come together in one huge collision and put us where we are now. RM: You mentioned Walter Trout earlier; Walter has been a mentor to you and a champion of your talents but I have to ask about his "cross between Eric Clapton and Buddy Guy" and "genius" comments. Those are compliments beyond measure, but how did you react to them? LJ: Well, hearing that from your hero, it honestly brought tears to my eyes. Walter has mentored me along the way and helped me more than anyone else in the music industry; he really has guided me along the way and to take that time when he’d been dealing with so much stuff of his own. As you know he recently had a liver transplant that saved his life, yet even when he was really ill, he promised he would play on my album and he stuck to his word. I owe a lot to Walter. LJ: Also, he’s so much more alive now. He said something really funny to me, which was "do you know what, Laurence? I found the cure to being bald; you just have to drink lots of alcohol, be completely rock and roll – and get a liver transplant! RM: Temptation established your blues credentials but your third album, What’s It Gonna Be, was your Coming of Age album. You covered all the blues-styled bases with a cracking set of self-penned numbers from the shuffle-driven blues of Evil to the hard, pacey melodic blues of Touch Your Moonlight and on to the blues-pop of All I Need and Set You Free, to name but four. Fabulous album. LJ: Thank you so much. By the time it came to recording that album I’d gained a lot of experience on the road and learned a lot along the way so I knew exactly what I wanted – a modern, blues rock album for the modern blues era; that was the vibe we went for. What’s It Gonna Be was all about lyrics and songs that would connect with people and not just a bunch of twelve-bar blues like so many blues bands do. We tried to be really creative with that album and I’m very proud of it. RM: What’s It Gonna Be also includes a great, AOR styled cover of the Bad Company classic Can’t Get Enough. The song also features American singer and actress Dana Fuchs on guest vocal. LJ: I wanted Dana Fuchs to sing on the album because we were both on Ruf Records, we had jammed together at The Stables in Milton Keynes and we had this great connection. I said to Dana "you have to sing on my album!" because she has this fantastic voice that just hits your soul; it’s an amazing searing-blues voice but it’s just got so much warmth. So I started to think about what would be a really cool cover for us to do; I picked that song because I thought she would just blow it away. LJ: [laughs] I’m really pleased that Dana’s become a good friend of mine, too. She invited me to play on Gallows Pole with her at Carnegie Hall in New York earlier this year – that was pretty special for me because when I look at Dana I see the female version of Robert Plant! [laughs]. Dana is so rock and roll and she’s just so cool! RM: The closing song on What’s It Gonna Be, Stop Moving the House, is a full-on, foot stamping fun slice of old-school rhythm and blues – or perhaps "drunk rock." RM: We’re still talking in terms of What’s It Gonna Be as your current album but you’re powering on at a fair pace because your fourth album has just been recorded, with legendary blues producer Mike Vernon at that. What led to that working relationship? LJ: I wanted Mike to work on my second album but Mike only works when he wants to and with people he really wants to work with, or when he feels that they’re ready. So I guess that the timing wasn’t right but, as it turned out and as we’ve talked about, we got to record in Louisiana with Mike Zito. But Mike Vernon had obviously been watching us and we kept in contact; I invited him down to the Colne Blues Festival when we performed there in 2015. He saw us play, became interested in doing the next album and I sent in some demos; we spoke on the phone, chatted on Skype and we just really clicked. So to work with Mike, and for him to take me on board, was a massive honour, but it was also so easy and just such a pleasure to work with him. Mike had a lot to do with the production of the album and its sound but the one thing I was really surprised about was how he kind of let me develop myself, although when he needed to step in he would step in. When I asked him why he did that he said "because you have to let the artist breath; they are the ones with the ideas." RM: Sounds like the best of both worlds and the perfect studio partnership. This is another album that will feature another cool cover because I know you recorded a version of Stevie Wonder’s Higher Ground. In fact you are currently performing a cracking version of it in your live sets. LJ: It’s also another cover that features a guest singer and another good friend of mine, Rueben Richards. Reuben is an amazing soul singer who was recently on the BBC Radio 2 playlist; he can sing like Stevie Wonder and I’m a massive fan of Reuben’s so it’s going to be fun for the fans to hear our two voices together on that song. RM: As regards covers, both in terms of recordings for the albums and those you perform live, do you pick them or is it a collaborative effort? I like to make sure there’s a couple of covers in the show and in fact a lot of people actually come to my gigs just to see what covers I’ll mix up in the set! As you know we’ve done Good Morning Blues by Lead Belly – I actually got picked up on that track, from having it played on BBC Radio 2, to being invited to play it at the Royal Albert Hall as part of the Lead Belly Fest with the likes of Van Morrison, Eric Burdon and Paul Jones. So doing it in your own style can go a long way! RM: Talking of the live environment, this is the perfect time and opportunity to introduce your band. You mentioned Roger Inniss a little earlier; Roger seems to be the perfect bass-playing foil for you. LJ: We just get on so well and everyone who comes to see us does mention that we seem to have such a great connection on stage. Roger has been playing since before I was born – he’s been a professional musician for nearly fifty years now – and having that experience on board is fantastic. Roger also has such a great vibe to him and he’s played with absolutely everybody [laughs] so yeah, it’s great to have Roger on board. RM: The relatively new addition to the Laurence Jones Band is Phil Wilson behind the kit. LJ: Yeah, Phil is a great fit and another that’s played with a lot of guys including Jesse Davey from The Hoax and Scott McKeon, who has supported the likes of Joe Bonamassa and Eric Clapton. Phil’s been around as well but he’s a young guy with that modern edge to him; so with the three of us in combination we have a team that really seems to work. As I said earlier it’s all about having the right guys around you; I'm very happy with the band we have right now. RM: The other thing about the power trio format is there’s nowhere to hide – you all have to be on your game and be in sync with each other and the music. LJ: Oh there’s no hiding behind anything – it’s very real! [laughs]; but we go out there and give it one hundred per cent every night. RM: That leads to something I want to make sure people are aware of. As you mentioned earlier, you’re a high-volume of shows a year band and you do indeed give it your all each and every night. Which makes the fact you do this with Crohn’s Disease – not exactly the best bedfellow for the rock and roll touring lifestyle – all the more remarkable. LJ: Yeah, it’s the worst combination ever [laughs] but, if I didn’t have my music, I don’t know what I would do; my music keeps me alive. It’s what I go to if I feel ill, or down, through the Crohn’s. A lot of people say to me "how do you even cope with Crohn’s on the road?" because some people can’t even get out of bed with it and I’ve got it really bad – I have to take ten tablets a day and have regular blood transfusions around once a month. But my music is also my healer. RM: Well music can be a powerful, positive force but you, young man, are an inspiration; especially to those who suffer from such a debilitating condition. LJ: [laughs] No, I can’t eat any fast food. I have a very strict diet and very strict backstage Food Rider, where it’s mostly just plain foods – lots of potatoes and veg – and that’s about all I eat. It’s pretty boring, but it has to be done because if I get ill on tour there’s nowhere to be ill! But my fans have been incredible; at first I didn’t want to talk about it my Crohn’s because I felt it was a little bit embarrassing and I didn’t even know what it was myself but my fans have been very supportive. So many people have come up to me at the gigs and said "I have Crohn’s too and you’re an inspiration." To hear that? That really keeps me going. LJ: That’s right, because it’s an invisible disease. People may look at me and think "well, he’s a young, healthy and fit lad" but it’s not like that; it doesn’t work like that at all! The main thing is rest. When I’m at home I rest a lot – but I also like to work [laughs] – so for me it’s getting the balance right and watching what I eat. But the music does, honestly, keep me going. I wouldn’t be able to do it without my music. 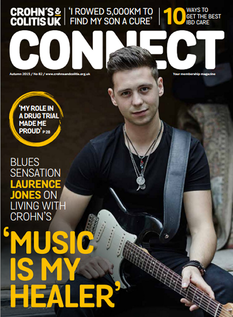 I’ve also been really fortunate to be able to work with the charity and they’ve really supported me – they have a brand new magazine out called Connect and I was on the front cover of that last October. Then, at the end of 2015, Paul Jones of the Manfreds and BBC Radio 2 asked me to play at his Christmas Charity night at the Cranleigh Arts Centre, which he does once a year; he very kindly helped me raise ten thousand pounds for Crohn’s Disease that night. So that was a great end to the year for us! RM: And thus far a healthy musical start to 2016 with the successful Finnish tour, the current UK tour and the in-the-can fourth album. Here’s to the rest of your year and beyond being just as healthy, Laurence; you most certainly deserve it. LJ: Cheers, Ross, it’s been great speaking to FabricationsHQ; thank you so much! Audio tracks presented to accompany the above article and promote the work of the artist.